We are supplying components like rocker shaft, main nut, half nut for suspension assemblies. Our product-line includes good quality rocker shafts that are suitable for applications in all types of automobile. Out shafts are available in various dimensions. We test the products for durability and tensile strength. By using good quality metal, our rocker shafts portray high resistance to corrosion. A rocker arm (in the context of an internal combustion engine of automotive, marine, motorcycle and reciprocating aviation types) is an oscillating lever that conveys radial movement from the cam lobe into linear movement at the poppet valve to open it. We are engaged in manufacturing and supplying Rocker Arm Shafts. These rocker Arm Shafts are made with close dimensional tolerances. The offered components are mainly used in automobiles. Raw material used is of very high quality which ensures long durability and high performance, easy maintenance, energy efficient. The Rocker Shaft we offer is a significant component of precision engineered machine components. Rocker shafts offered by us find application automobile industry. These Rocker Shaft are designed in strict compliance with the international quality standard. Our prices are most competitive and range is hard-wearing and resistant to wear and tear. 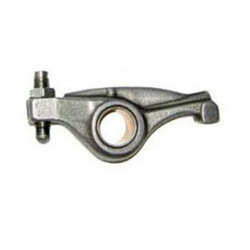 Extensively used in internal combustion engine of automotive, motorcycle and two & three wheelers, the range of Auto Parts (Rocker Arm) offered by us is appreciated for its quality and durability. This precision turned component is used in the critical mechanism for monitoring the anchoring of the vessel. Rotating tube is manufactured from SS316L/1.4404 grade of stainless steel. We are leading manufacturer and exporter of Rocker Shaft and our product is made up of good quality. In order to cater the variegated demands of our clients, we are offering an excellent quality range of Rocker Shaft.